Ok, wow. As a big Genesis fan and one who has followed the solo careers of most of the members, I'm pleasantly surprised by (and shocked that I've missed it all this time) the debut solo album from early Genesis member Anthony Phillips. "The Geese & The Ghost" (1977) is stunning in it's beauty and brilliance. This review from daveconn at progarchives.com captures it well. ANTHONY PHILLIPS was little more than a footnote to the great career of GENESIS; that is until he released "The Geese & The Ghost" in 1977. Blending orchestral and acoustic instruments, PHILLIPS' debut album had a grace and grandeur unseen since the days of "Trespass" and "Nursery Cryme". Featuring the participation of MIKE RUTHERFORD, PHIL COLLINS (on vocals), JOHN HACKETT, JACK LANCASTER and others, it was ANTHONY's money shot, and he made it pay off in a big way by delivering the best music of his life. In a sense, ANTHONY has become a victim of his own success, since subsequent albums have fallen invariably short of "Geese"'s goals, but that's a discussion for another day. If you enjoyed the pastoral prog rock of early GENESIS, more wonders await you. There is, for example, the story of "Henry: Portraits of Tudor Times", in which the players from the Age of Chivalry walk again. There are songs featuring PHIL COLLINS ("Which Way The Wind Blows", "God If I Saw Her Now") that match "More Fool Me" for beauty. 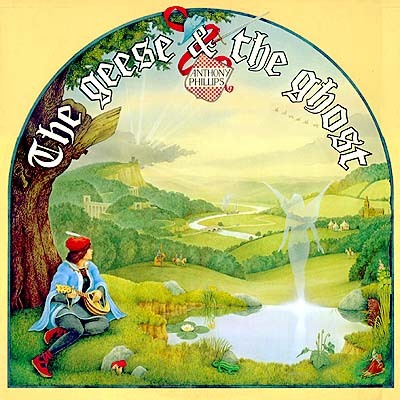 There is the stirring title track, "The Geese And The Ghost", with its gentle agility sure to delight GENESIS fans who thought the realms of magic lost to the late '70s. To put this into perspective, there are only a handful of albums to my mind that will delight core followers the way "The Geese & The Ghost" does. For GENESIS followers, Voyage of the Acolyte becomes the reference point (though that was a deliberately darker work). For YES fans, JON ANDERSON's Olias of Sunhillow or RICK WAKEMAN's "Six Wives of Henry VIII" yield as much pleasure. Some of "Geese"'s credit must go to MIKE RUTHERFORD as well, who appears alongside PHILLIPS throughout and shares his affection for acoustic adornment. In a sense, "Geese" also stands as RUTHERFORD's best solo album outside of GENESIS. Listening to this album in "Spring or Summer", when the scent of a world in bloom wafts gently through the window screens, is to be in concert with life itself. If you don't own this yet and have played "Foxtrot" down to nubby grooves, do yourself a favor and grab this golden goose. The new album, Blood , from OSI is already out in Europe and is set to be released stateside on May 19. Special guests - Gavin Harrison - drums / Mikael Åkerfeldt - vocals/lyrics on Stockholm. Attention power pop/Jellyfish fans! Check out Secret Powers! Fun power pop! Two albums out so far. Listen to tracks on their MySpace page. You just gotta check out all of the unbelievable, sugar-filled pop ingredients that went into this charming, extremely special, intoxicating pop cocktail outta Missoula, Montana - healthy heapings of Jellyfish, Jason Falkner, and Roger Manning, a pinch of Beach Boys, a smidgen of Paul McCartney, a teaspoon of ELO, a dash of Supertramp, a drop of Jackdaw4, and tiny jiggers of Supertramp, The Nines, Ben Folds and Gabe Dixon! The band was one of 2008`s strongest debuts and a best seller at Not Lame and here is #2. "Secret Powers sounds like pop. It sounds like washing your tricycle on a bright waxy blue sunny day. It sometimes sounds like long feathered tresses and platform shoes, sometimes like Nehru jackets and sensitive facial hair. It sounds like girl-watching and dopey desire. It sounds like melted ice cream, dirty feet, and sticky faces. The following is taken from the Transatlantic web-site.